Yesterday has to be the worst flight I had during my first AirAsia experience, when our flight was delayed twice, first from 4pm to 8pm, then to 10:30 pm, thus, moving our arrival time at Kuala Lumpur from 8pm to 2am of the following day, and we were given a complementary snack coupon only (100 baht that can buy you a lone donut), without dinner, and to make things worse, the plane seemed to have landed at the farthest corner of Kuala Lumpur Low Cost Terminal, and we had to walk an entire kilometer round the airport while it’s raining, which by the way had us wet because the plight of stairs from the plane down to the ground has no roof and there was just one person at the foot of the stairs, opening the umbrellas for us, and so we all arrived at the immigration area wet, hungry, sleepy, exhausted, and worried because it’s past 2am already and the last aerobus going to the city leaves at 2am, so some of them waited for the 4am bus, and some of us booked a cab at a rate of 10 times more than the bus fare (8 ringgit compared to 111 taxi ticket) since it’s past midnight and there’s a 50% surcharge, and really, all these experiences confirm that aphorism “pay peanuts and you get monkeys,” but in fairness to other low cost airlines, I never had a series of unfortunate events with Tiger Asia or Jetstar, and what makes me more bitter about this is that, all my flights to Singapore and the Philippines are paid for by the company and that it’s my own money now paying for this BKK-KL trip, and I felt my money wasted however cheap it is, so really, the lesson is to never fly AirAsia again if it can be avoided. On a bright side though, said the Malaysian guy next to me on the plane, it’s better we had the engine failure on the ground than up in the air. 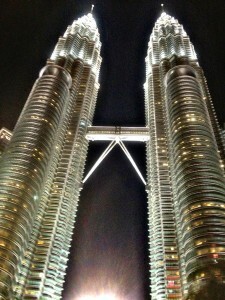 And after seeing the Petronas tower tonight with Ms Kei and Mr Ranie, I felt better. KL has a character that can challenge that of Bangkok.